In my experience, excluding people with disabilities is not usually a matter of ill will on the part of organisations. In some cases, development practitioners are simply not aware of the needs and capabilities of people with disabilities, who are not very visible in our society. In other cases, mainstream development organisations are hesitant about the time and energy needed to take a more inclusive approach. They may find advocacy about inclusion an irritation, adding another layer of compliance that they are unable to conform with due to limited resources. Count-me-in: The Practical Guide for organisations in the North and South talks about two approaches to disability that dominates this thinking: the medical approach (expensive experts can only advise about disability issues) and the charity approach (little to no outcomes will be achieved as people with disabilities won’t be able to achieve as their peers would). As the guide lays out, both of these approaches are wrong, and are part of why people with disabilities are so often left out. The guide is the most helpful resource I have found to help organisations understand the steps to becoming an inclusive developmental organisation. It has also been hugely beneficial for my own learning and confidence in the subject: it helped me think about problems more inclusively, and to create strategies that are not exclusionary but universally accepting of all people experiencing the problem. In my view the following are the 4 key first steps organisations can take to ensure that their developmental programmes are inclusive (informed by the Count-me-in guide). Disability is not simply an attribute of an individual. It is an interaction between a person and his or her environment. Disablers can be distinguished between those that cannot be changed (like high mountains) and those that can be changed (like a staircase that could be made into a ramp). Many disabling situations or conditions can be addressed by anyone – not only by traditional “disability specialists”. One study found that 80% of persons with disabilities can participate in social life without any specific additional intervention or with low-cost and simple community-based interventions that do not require any specific rehabilitation expertise[i]. Disablers or barriers preventing participation can be divided into attitudinal, environmental and institutional barriers. Attitudinal barriers are sometimes the hardest to overcome. Project staff and other individuals may assume people with disabilities are incapable, dependent, of low intelligence and in need of a special service or cure. These attitudes often cause the biggest problems for people with disabilities. The two most common environmental barriers are physical, such as inaccessible buildings and communication such as curriculums in printed media only. Working with the individual with the disability is the best way to overcome these barriers. Discriminating legislation or recruitment systems are considered institutional barriers. An example of this is a school programme with admission criteria that all children should be able to play at least one sport unaided/independently. Such systems exclude children with disabilities. Encouragingly, more and more agencies are moving towards mainstreaming disability issues into their existing programmes. This way of working is known as a twin track approach to disability. This means that a mainstream organisation will implement a disability-focussed program to address the needs of those within their target group, for example youth, that have disabilities. As an example, Action Volunteers Africa’s have established a programme that trains, places and mentors young volunteers with disabilities in work experience placements for one year. The programme may require specially trained staff and an adjusted timeframe but the activities are usually very similar to the mainstream programme. In this instance many mainstream organisations partner with disability organisations for support. The mainstream organisation, however, will also include the concerns of people with disabilities as part of all mainstream projects. Ilifa Labantwana, Afrika Tikkun, Poverty Stoplight have adopted this approach with great enthusiasm and impact. The twin track approach does not mean separating able bodied and disabled people from each other or offering two completely different programmes. It involves rather two streams of services that people can opt into. Many people get uneasy when talking about disability or meeting a person with a disability. The fear is that you will say or do something wrong, and perhaps offend the person in some way. The best way to take away the uneasiness is to have direct interaction with people with disabilities, to share fears, concerns and have a good laugh about it together. Staff training and sensitisation is also important. I had a great opportunity last week to take my colleagues to the special needs school where I used to work. They finally got to experience what it means to interact with children with disabilities. The simple activity of storytelling brought home the point that all children can interact and engage with you, regardless of their ability. The road towards including people with disabilities is one that many mainstream organisations are just beginning to walk. To make this journey easier, make friends! Friends with disabilities, funders with an interest in inclusion, innovative friends as well as critical friends. For example, involve trainers with disabilities to train staff, or ask individuals with disabilities who could use your services to help you identify barriers. This will go a long way in making the road smoother. We cannot afford to exclude people with disabilities. Yes, inclusion does cost money – but not as much as you think. There are many low-tech solutions that can be used to remove barriers to participation like seating equipment made from low cost materials and communication tools made using pictures from magazines or on a phone. 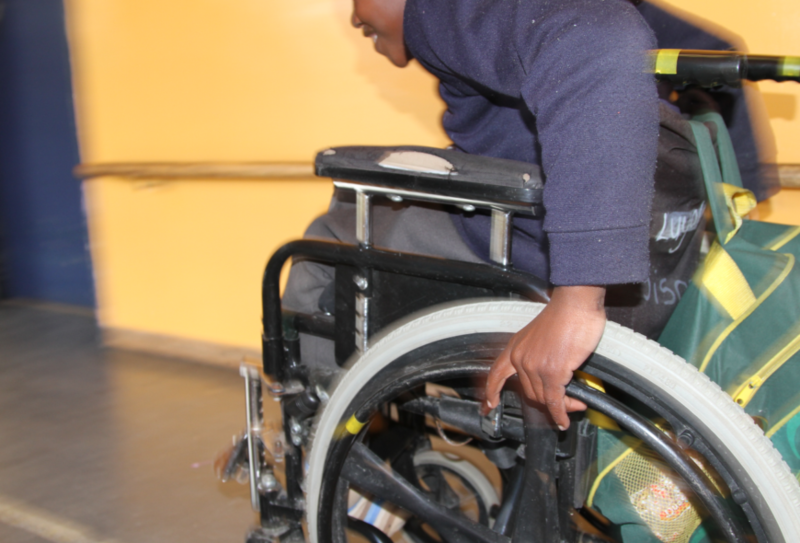 Major stakeholders, such as Mobility International, advise a budget allocation of 2-7% to include people with disabilities into regular programming. Besides the fact that access to services for people with disabilities in a human right, we cannot afford for approximately 15% of our population to be excluded from the economy. With no work opportunities people with disabilities, their families and generations to come will continue to fall deeper into a poverty trap. It is the role of mainstream organisations to open up their programmes for persons with disabilities, to remove the barriers and to make the services accessible. Nothing more, nothing less. When individuals with disabilities were asked what development organisations could do to include people with disabilities their response was simple, “No pity, just an equal chance and a bit of encouragement”.